In a recent article titled, "New Efforts to Simplify End-of-Life Care Wishes," the Wall Street Journal's Informed Patient columnist Laura Landro featured a new type of advance care planning tool known as Physicians Orders for Life-Sustaining Treatment (POLST). 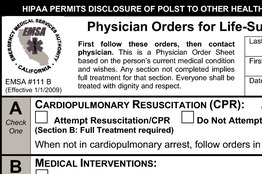 POLST is now in use in 14 states and occasionally goes by different names, such as Medical Orders for Life-Sustaining Treatment (MOLST), or Transferable Physician Orders for Patient Preferences (TPOPP), so you may need to ask your doctor or nurse what your local variation is called. The main difference from a living will is that POLST forms are actual physician orders, instead of listings of your preferences only to be enacted if you were unable to make a decision like a living will. The article points to how these new forms are being implemented and at the end they also mention National Healthcare Decisions Day! Hear Laura Landro discuss POLST in a podcast here.